Now in its 54th year, the Visual Arts Center of Richmond’s Craft + Design Show showcases the work of over 150 artists from across the nation. This year, 20 of those artists have ties to VCUarts. These VCU grads are skilled craftspeople who will bring a variety of museum-quality craft to VisArts’ weekend-long shopping event. Several of the VCUarts alumni exhibiting at Craft + Design are also VisArts instructors. Alicia Dietz is a former Army pilot who graduated with an MFA in 2016 and has since exhibited her work in Chicago, Maine and Australia. As a wood artist, she aims to bridge the gap between military and civilian life, encouraging interaction, discussion and pause. The artist said her time at VCU taught her the ways in which craft can convey a larger message and the effect that it has on communities. Since getting his BFA in 2009, glass artist Grant Garmezy has been busy traveling and teaching in places such as Tokyo and Istanbul. In 2015, Garmezy was recognized with VCU’s 10 Under 10 Award, which recognizes the noteworthy and distinctive achievements made by alumni who earned their first VCU degree within the past 10 years. Originally planning to travel the craft circuit, Garmezy got so busy that he “never left town” after building a strong, Richmond client base. Since graduating from VCU, Garmezy’s work has evolved. Today, his practice is focused on high-end glass animal sculptures. Caitie Sellers, who earned her BFA in craft and material studies, says choosing VCUarts was the best decision she’s ever made. Her work as a metalsmith has landed her residencies and professional experience working in places like Guatemala and Australia. A Craft + Design veteran, Caitie won both the Best Booth Design Award and the Best New Artist Award at Craft + Design in 2016. This year, she’s returning to showcase her work, which is based on the urban landscape. Elaine Butcher has been busy experimenting with jewelry in the nine years since she earned at BFA at VCUarts. After apprenticing with Charlottesville-based jeweler Gabriel Ofiesh (another Craft + Design exhibitor) for over three years, Elaine launched her own company, Elaine B. Jewelry. Today she operates out of Detroit, Michigan, where she creates an ethical, minimal and wearable production line as well as custom rings and jewelry. 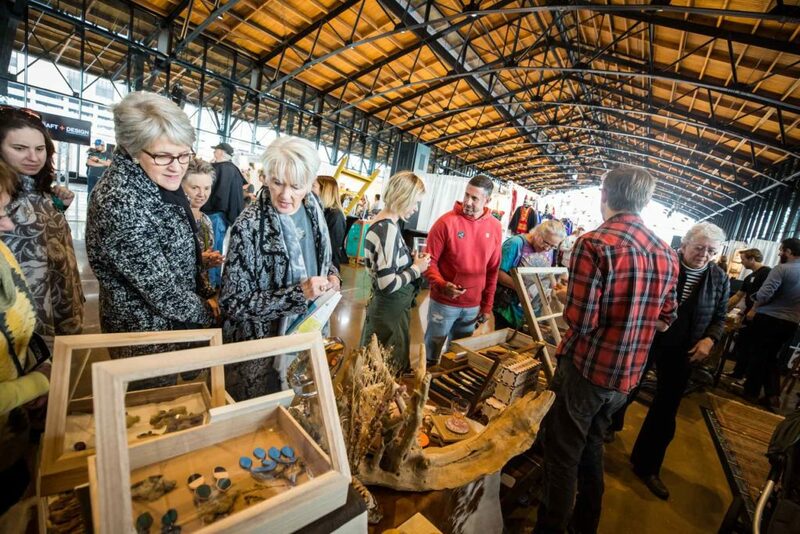 VisArts’ Craft + Design Show is held every year, the weekend before Thanksgiving, in Main Street Station’s historic train shed. The event gives Richmonders a chance to eat, drink and shop museum-quality contemporary craft. All proceeds benefit the Visual Arts Center of Richmond. Learn more and buy tickets.